If you’re thinking of hiking the Grouse Grind in Vancouver, here is what you need to know BEFORE you climb. As a personal trainer, I’ve climbed it dozens of times and taken many groups up the trail, several times a year. Now first off, I love to hike. Living in BC, it’s difficult to avoid the multitude of outdoor activities and enjoying a beautiful hike a natural way to exercise outdoors. The very first time took on the Grouse Grind, a friend and I packed a beach towel, giant water bottle, snacks, a small lunch, laced up our boots and…well we didn’t realize what we were in for. We finally got to the half-way point, (I won’t mention that my friend had a cigarette), had lunch, waved off mosquitoes and wondered how many people turned around and went back down. When we finally made it to the top and were rewarded with an amazing view of the city below. So what can you expect from Grouse Mountain’s “Grind”? 10. How tall is Grouse Mountain? How fast? Where? When? Why?! Grouse Mountain, located in North Vancouver, was named officially in October of 1894. No gondolas, no neatly carved trails and definitely no lumberjack shows being held every hour at the top; just tough as nails hikers with heavy backpacks, mountaineering gear and hiking boots, hauling up construction equipment, wood and supplies. Thankfully today, we now have the option of taking a quick gondola ride to the summit, or using our own power to climb it on our own! Lovingly referred to as “Mother Nature’s Stairmaster” here are some statistics about the Grouse Grind. * Opening months depend on the snow and weather conditions, but you can expect anywhere between April / June opening. * 2.9km ascent, with an elevation gain of 2,800 feet. * Hiking Goat Mountain at the top, which will bring you to the summit of 3,700 feet. Over the last 10 years, I have seen the type of people that are attracted to the Grind expanded significantly. When I first did it, it was left for the die-hard, fitness fanatics that saw this as an opportunity to do their cardio outside, instead of on a treadmill or stairmaster. Personal trainers challenged each other all the way to the top. I once had a man pass me, carrying a bike on his shoulder. We loved it. It was quiet. You could stop when you wanted to and people nodded or said hello to each other on passing. Today is a different story. 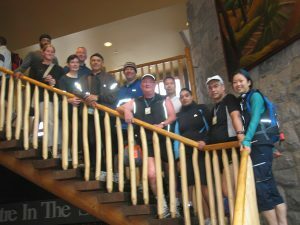 The Grouse Grind has become so famous that everyone has to check it out! Statistics show that over 100,000 people hike the trail every year. That makes it pretty busy and this has become a sore spot for people who continue to use it for cardio and setting “personal bests.” Fitness buffs tend to blow past the more leisurely hikers with a brusque “on your left!” and there are few opportunities to sit and have a picnic on the trail. Locals are not joking when they call it Mother Nature’s stair climber. You will see everything from unprepared tourists pausing to take photos, to parents taking their children (both carried in a backpack and trying to keep up), and super-fit speedsters (you hear them coming), to curious average Joe’s giving it a try for the first time. Tip: If you want to go with fewer crowds, early morning (7:30am start) on weekends and weekdays are good times to choose. The trail consists of a combination of man-made wooden steps, some natural rock and tree root “steps,” and the elevation gain of 2,800 feet is essentially a series of switch backs straight up the side of the mountain. You are surrounded by beautiful trees (about 90% of the trail is covered, so sunscreen isn’t necessary on the trail), fresh air and at times there are breaks were you can catch glimpses of the valley and water running. I’ve had friends see deer on the trail (one client had a deer follow her almost ¾ of the way up) and I’ve seen a bear and her cubs. Sightings of wildlife aren’t guaranteed, except perhaps squirrels, birds and bugs. On rainy days, the trail is relatively dry; I have done it on days that it was raining heavily, and a light water-resistant running jacket was just fine. I think I got more rained on in the parking lot and emerging at the top. Be aware that the trail still gets wet, so extra focus needs to be on foot placement, ensuring that your next step is on something solid, as it can be quite slippery. At the beginning of the season, there can be snow and runoff right up until June. Wait for the view at the top! Tip: leave the big camera at home and be prepared for many, many stairs. Mental toughness is a huge part of the equation for completing the Grind. As you hike higher and higher up the mountain, you get more fatigued and some people have noticed the air feeling thinner by the first quarter. I’ve had two different types of experiences doing the Grouse Grind, from hating every single step, sweat burning my eyes and feeling like my head was going to explode, so my lungs could make a break for it. On the flip side, I’ve had experiences really enjoying the company, laughing with people that I pass, making jokes with them and emerging at the top completely victorious. And on all occasions, my time really doesn’t change much at all, maybe 5 minutes difference. What I’ve discovered is what the voices in my head tell me (okay fine, it’s me), make the biggest difference to my enjoyment of the Grind. On the worst occasion, my internal mantra was “oh my God I hate this, why am I here, I should just go back down, I feel like crap, I’m going to die.” When I realized this awful song on repeat was NOT MOTIVATING ME, (I felt physically ill and thought I would lose my breakfast on every switchback) I changed my tune, to become my own personal trainer (as cheesy as it sounds) “you can do this, you’re awesome, keep going, you can take breaks if you need to, go girl go!” Though I have also spent a good chunk of the Grind with “meow meow meow meow, meow meow meow meow….” (insert Meow Mix commercial music). Other ways I’ve stayed motivated is by supporting colleagues, friends and clients that are at the same or slower pace than myself. I’ve had amusing conversations up much of it, and used it to re-connect with people and get to know them better. For people faster than me, we would set up friendly bets about their times and who would buy the smoothie at the top. Tip: I recommend an iPod (meow meow meow)…a great attitude and someone to go with. Try some motivating music, not Evanescence or Sarah McLaughlin (though I do love these groups, haha). Depending on how hard one pushes, heart rates are known to easily soar into (or past) the 90% of maximum heart rate zones (typical guidelines state that healthy individuals should not exceed 85% of their range). 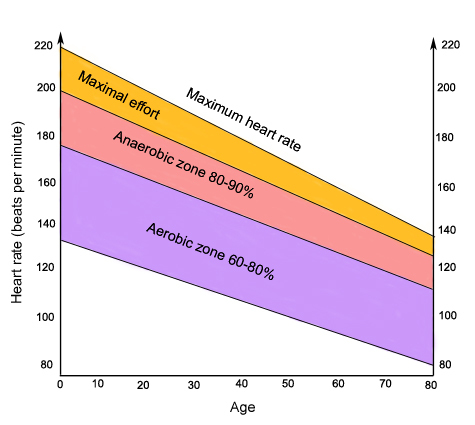 I can’t give an absolute minimum requirement of cardio training in order to say “oh yes, you can do the Grind” but I’d like to know that someone can easily work out for 40-60 minutes keeping heart rates in the upper range of their target heart rate to feel confident taking on the challenge. The “Grind” is well marked at each quarter of its trek. The first quarter of the hike is the longest quarter as you climb up the mountain. The second to third quarter is the steepest part of the climb. The last quarter is not as steep compared to the second and third quarter. Knee, hip or back injuries? Though you are able to take breaks whenever you need to, there may be moments that the next available step requires you to function outside your pain-free range of motion; so if you ARE stubborn enough to try it, please consult with your kinesiologist / physiotherapist / GP /surgeon etc.! Tip: Taking SMALL steps (versus large “two stairs at a time” steps) will reduce muscular fatigue. 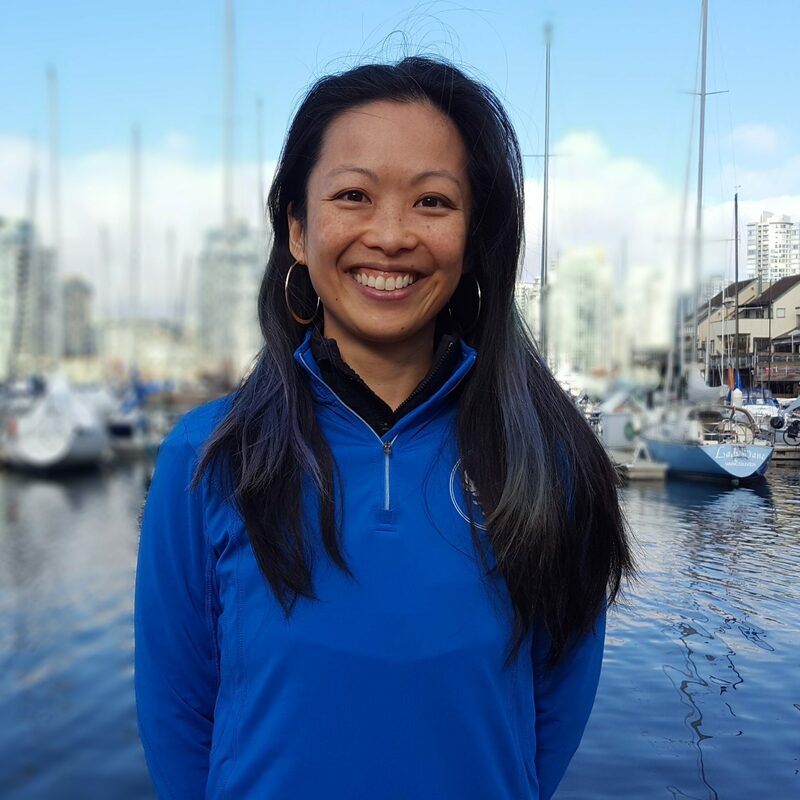 So years of chatting with my personal training clients and friends on the Grouse Grind, have allowed me to gather their comments, feedback and experiences into this post. I am happy to be able to share this perspective with you. 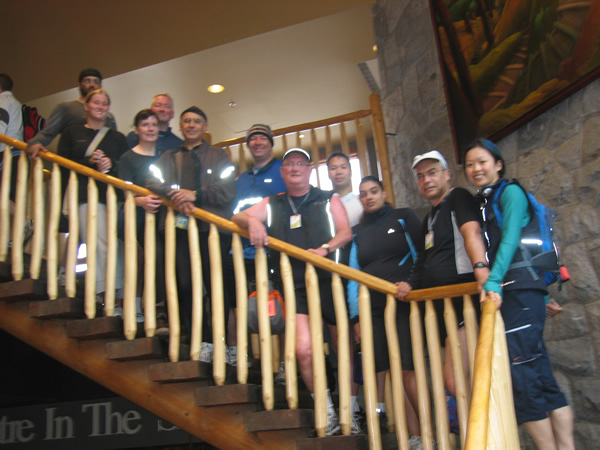 Click here for Part two, tips 1-5 to tackling Grouse Mountain. Awesome post Nicole! I’m looking forward to being able to do the Grind again!